The library recently purchased The Digital Loeb Classical Library. A complete, and digitized, library of the Loeb classical volumes from Harvard University Press. Over 500 translations of classical works, containing either the original Latin or Greek, alongside an English translation. Search the entire Loeb library in Latin, Ancient Greek, and/or English! A Harvard University Press overview video is available here or click on the image below. Off the grounds & need some classical literature? Please log in to vpn.sps.edu to access this (or any/all of the library’s eCollections). Digital Loeb Classical Library – Now Online. Prod. Harvard University Press. YouTube. 16 Mar. 2014. Web. 15 Dec. 2014. <http://youtube/ uQYy3Yml5r4>. 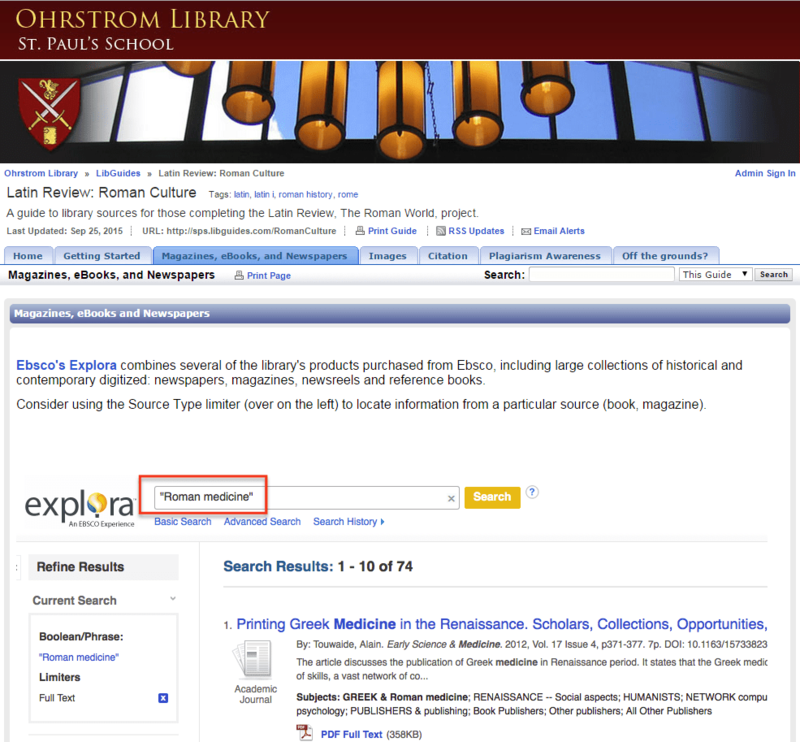 As you recall from your research guide, when looking for modern images ARTstor and Britannica Image Quest (both purchased by the library) as well as the Digital Public Library of America and Europeana (both free-on-the-web sources) should be quite useful. For your narrative, do consider the Oxford Art Online database and the mythology/Roman history titles found within the library’s Gale Virtual Reference Collection. As you remember, there is a research guide containing curated library eCollections selected for this assignment. Just getting started? The Gale Virtual Reference Collection is a great place to get background information on various aspects of Ancient Roman culture, as is the eBook Daily Life in the Roman City (Greenhaven, 2004) found within the Ebsco Academic eBook collection. Looking for voices from the time? Consider the eBook Voices of Ancient Greece and Rome (Greenwood, 2012) for documents created by Ancient Romans.